BRANFORD, Conn., May 18, 2016—Unfortunately, plumbing leaks are inevitable. But now homeowners and businesses can have valuable peace of mind knowing their property is protected from unseen plumbing water leaks and frozen pipes with the latest innovation from Reliance Detection Technologies (RDT), maker of the FloodMaster line of products. 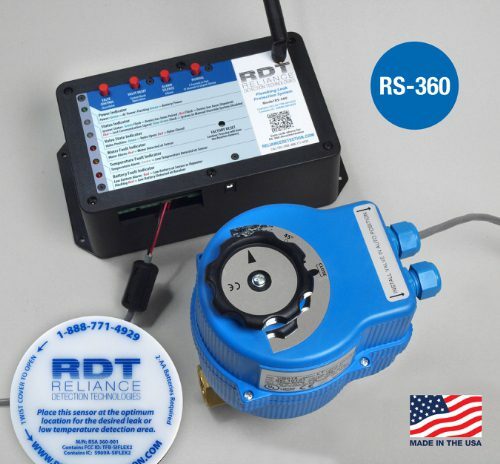 For smaller areas of coverage, RDT’s popular FloodMaster line of appliance-based (water heater, washing machine, HVAC condensate pans) leak alarm/shut-off kits, localized leak protection systems and basic water alarms are also available for every space and budget. The 360 is available through select Wholesale Suppliers and Dealer Installers. For additional information, or to find an authorized Distributor nearest you, visit www.RelianceDetection.com.